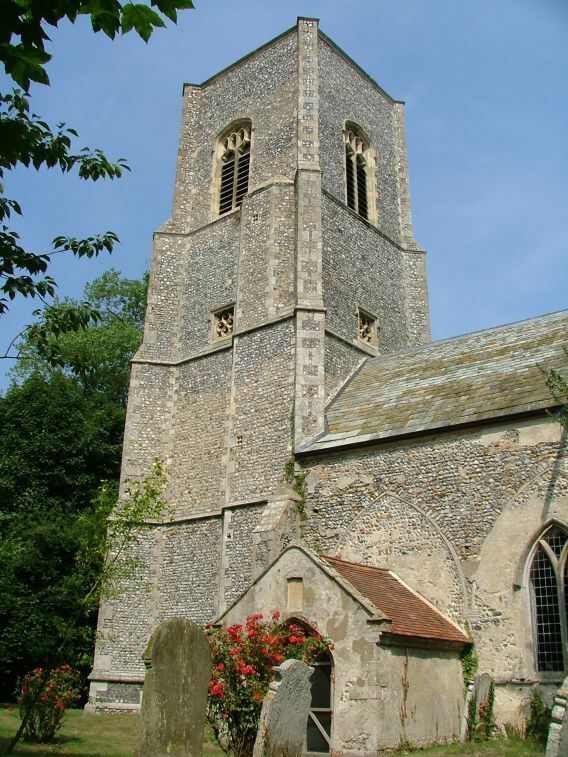 Here we are in north-east Norfolk again, in the lovely parishes of the Trunch Team Ministry. 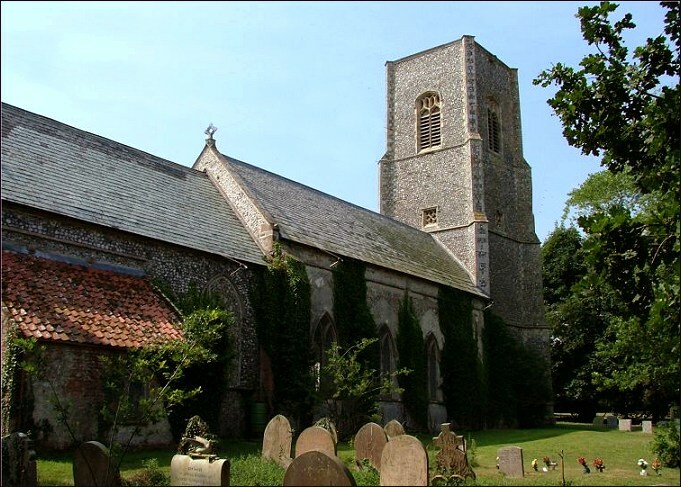 These are surely some of the most welcoming churches in England, and they are set along narrow lanes through pretty fields. The countryside rolls pleasantly, the hills steepening towards the coast, which is old-fashioned in the best way possible and popular with holidaymakers for that very reason. It was the end of July, and the harvest was well underway, the barleyfields full of roaring monsters tearing up the crop and dispensing the golden seed into trailers. There was a dusty haze in the heat, and I suppose that we will always remember July 2006 as the most beautiful month of the century so far. 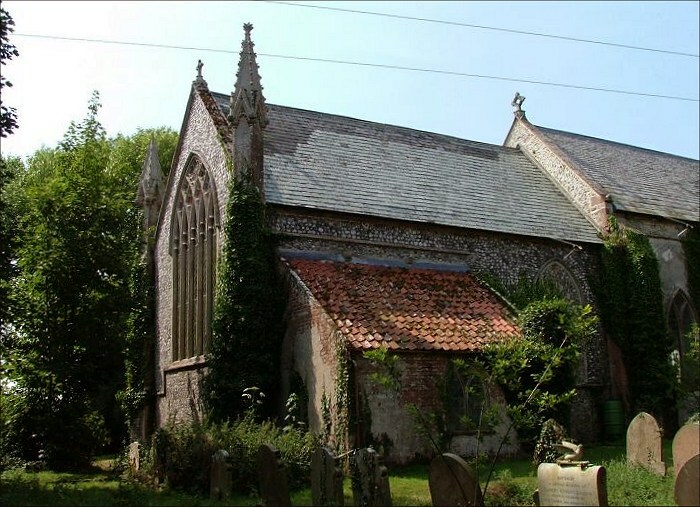 St Giles is probably the most remote of this group of churches, away from its village and with just a large farmhouse for company. The tower is a massive affair, and visible for miles. 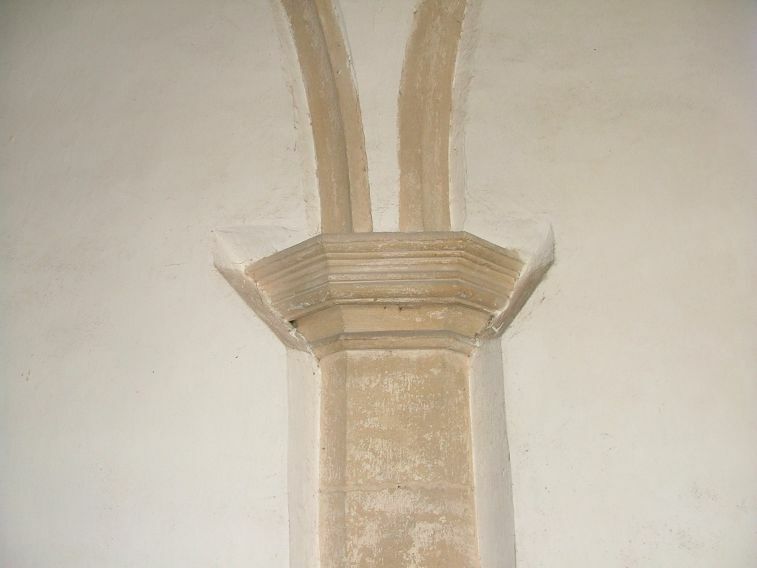 There are pinnacles at the east end of the chancel that the late 18th century church of Thorpe Market, a mile or so off, may have intended to copy. 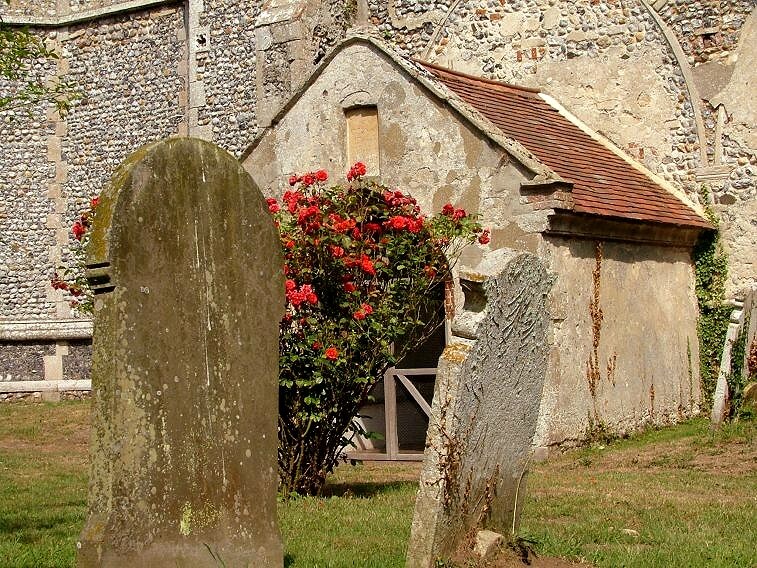 St Giles is beautifully set in its graveyard, which has just the right balance of wilderness and lawn. 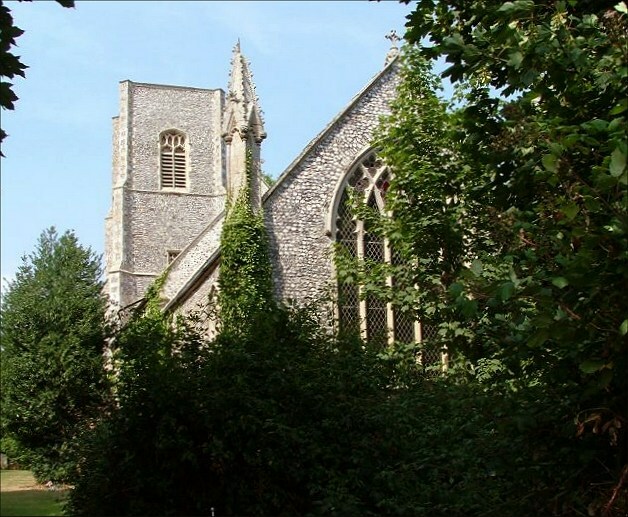 The church beginning to get a bit overgrown with creepers, which looks really nice but may not be doing it any good. It is a big church, but it was once much bigger. You can see this both inside and out, because the north and south arcades were filled in when the aisles were demolished. 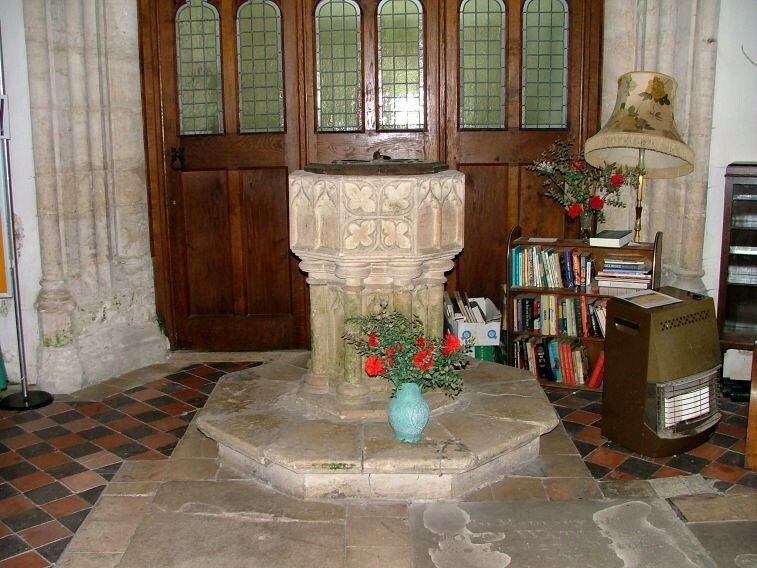 You can still see the pillars and arches set in the walls, the early 14th century capitals revealing the age of the church. 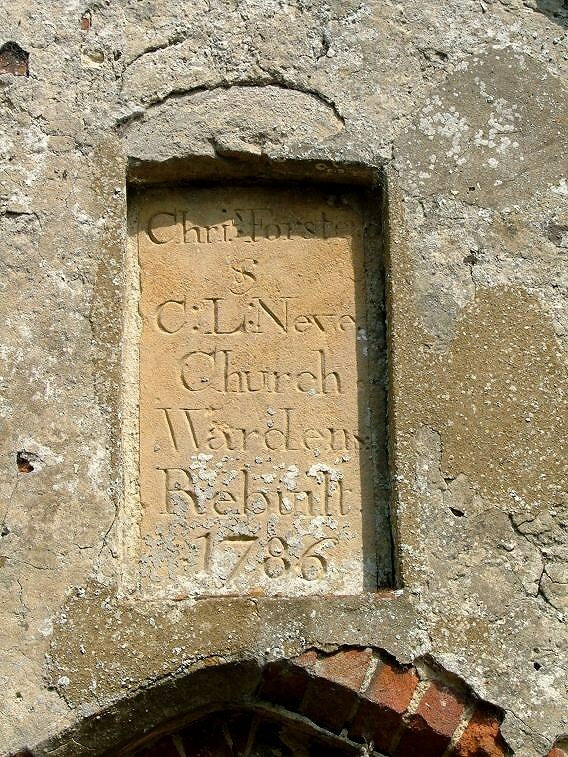 The porch is dated 1786, along with the churchwardens' names, which is probably shortly after the aisles were demolished. 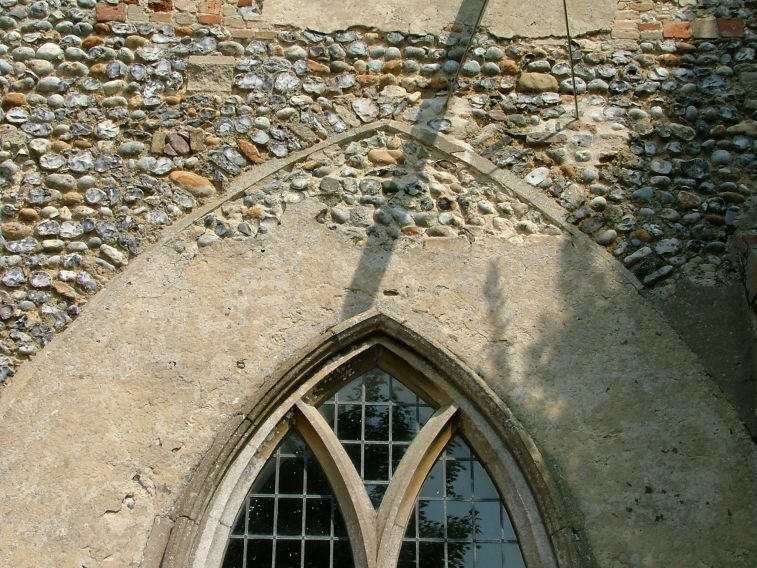 Interestingly, this is only ten years before Thorpe Market church was rebuilt, and if it was an attempt to make this one sound too, then we might detect the hand of Lord Suffield behind it. 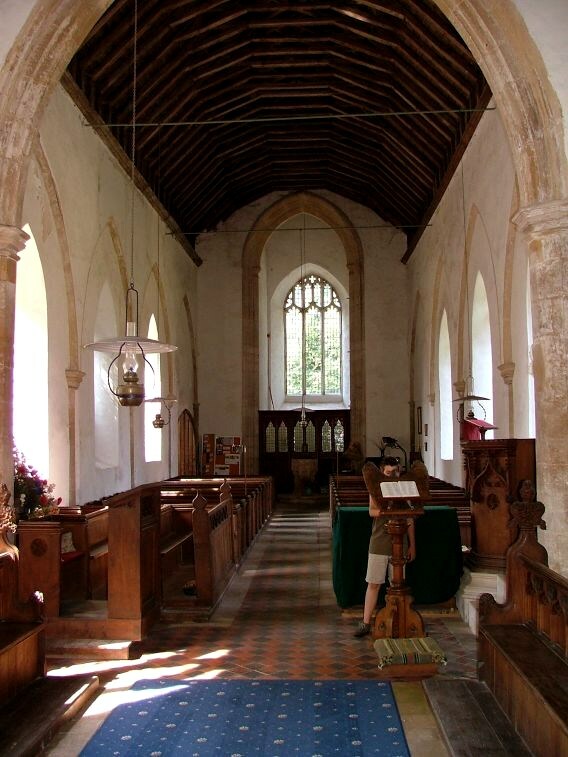 Given that there is no clerestory, and the east face of the tower suggests that there never was, this must have been a wide, square, low space before the aisles went. 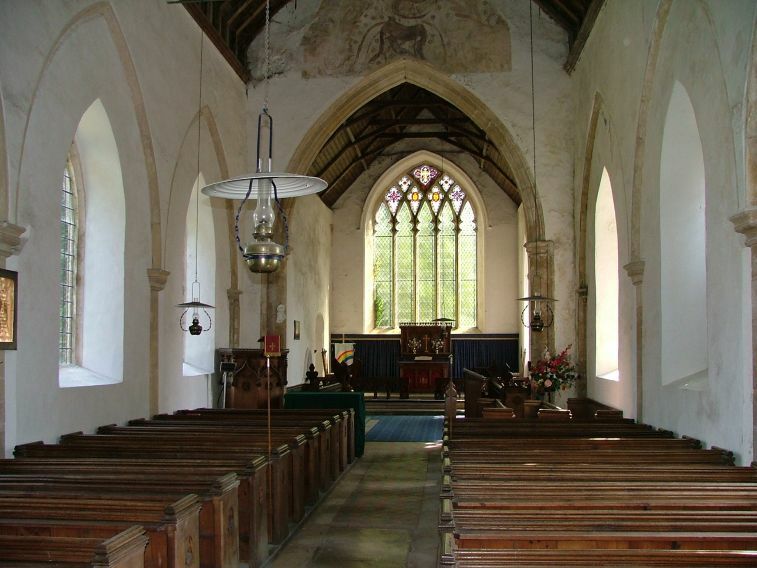 The chancel is still large, in proportion to the original nave, and its huge interlaced Decorated east window fill it with light. 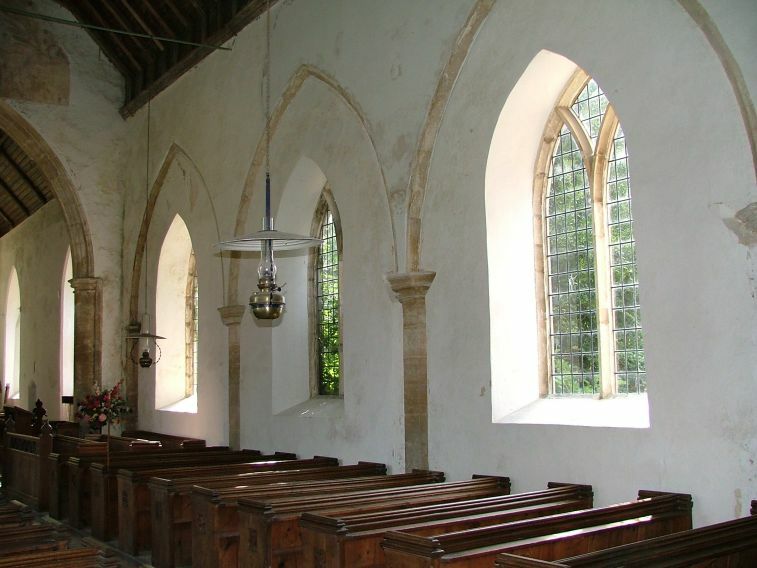 There are matching windows to north and south, but these are from the very good 1850s restoration by Robert Ketton, according to Pevsner. 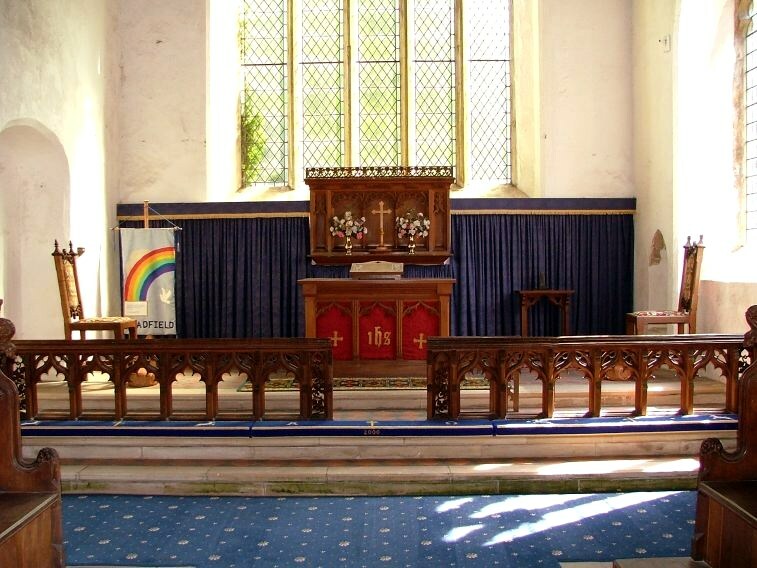 If you stand in the gloom at the back of the church and look east, it is almost as if someone has built a greenhouse beyond the chancel arch. 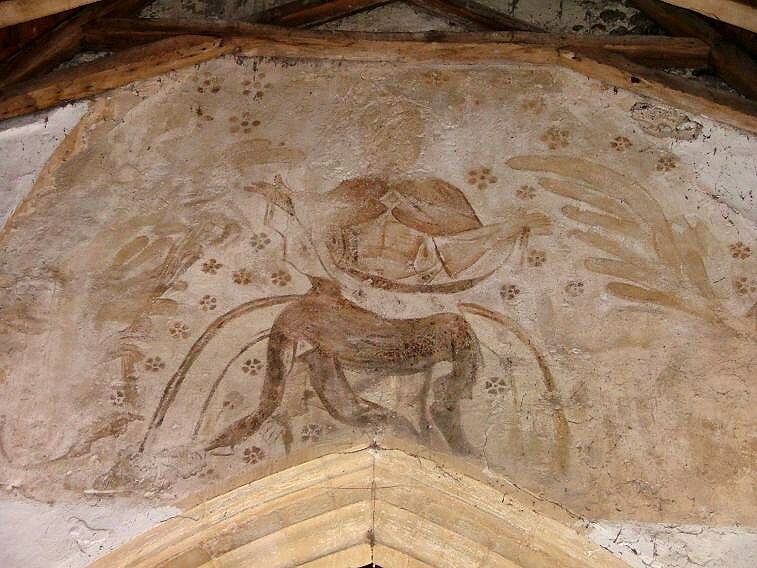 Above the chancel arch is Bradfield's greatest treasure, a wall painting of Christ in Judgement. He sits on a rainbow, and the feathery objects to left and right are angels' wings - you can see the angel to the south more clearly. It is 15th century, but much simpler and more benign than those terrifying Last Judgements we are more used to seeing. 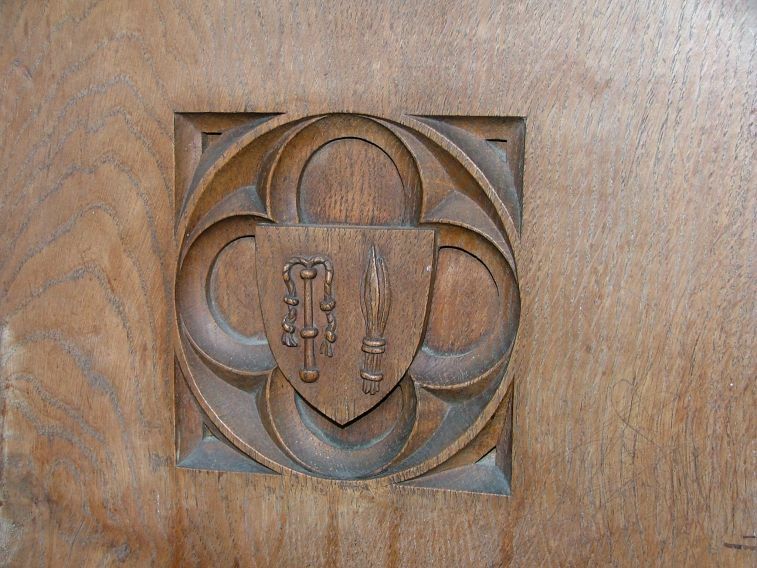 There are three pre-Reformation brass inscriptions with prayer clauses in the nave, and entering into the medieval spirit the 19th century benches have shields on them, which include details such as the Instruments of the Passion. The floors and other furnishings are almost entirely Victorian, but it is such a rustic, pleasing space that it avoids all anonymity. 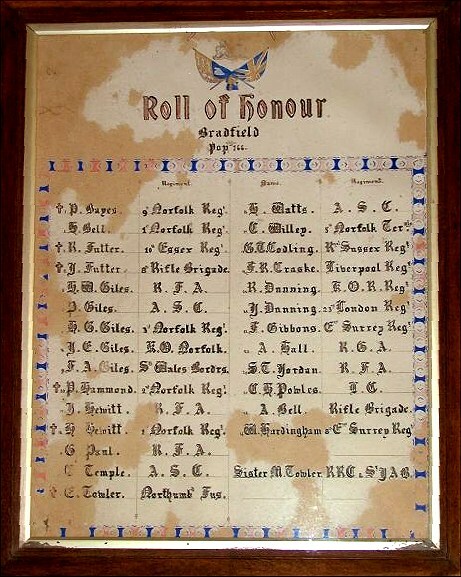 Poignantly, Bradfield is one of those rare churches which retains on display its handwritten WWI roll of honour, to which the names of local lads were added as they went off to fight.Twenty-eight of them went to France out of a total village population of 166. 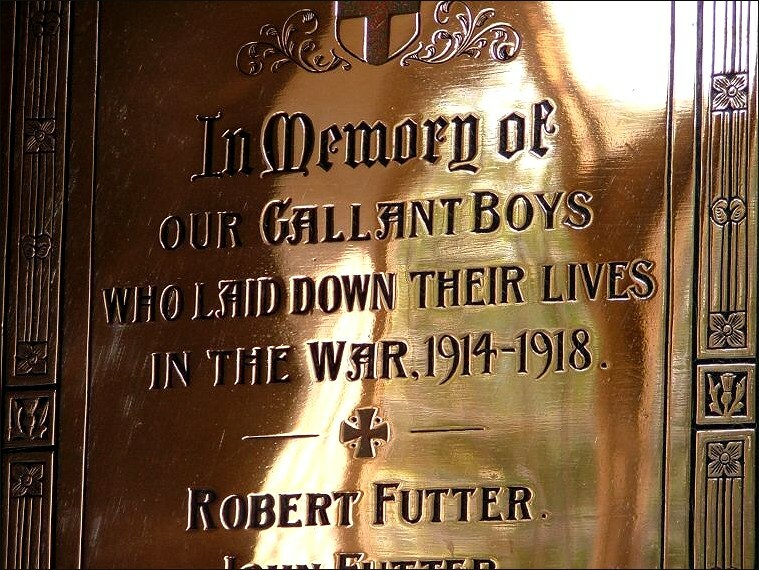 The war memorial to the east of it records the death of five from this tiny parish, calling them Our Gallant Boys. Two were from the same family, probably brothers.